As soon as Barack Obama uttered those eighteen powerful words in his first full month as President of the United States, he created a new economic standard for his administration. Though he would presumably never be caught voicing similar goals amid the upcoming November election, the grand expectations set by Obama fittingly align with his 2008 campaign’s unattainable levels of “hope” and change.” In fact, under the watch of President Obama, poverty rates have risen to 14.3%, unemployment rates have astonishingly hit 10% (the highest since the 1980’s), and the average number of weeks unemployed has doubled since January 2009, reaching over 40 weeks. American families have seen their median income lowered from $52,029 in 2008 to $49,445 in 2010, average health care plans grow from 2008’s $12,680 to 2011’s $15,073, and foot stamp usage rise from 2009’s 31.9 million to 2011’s 45.2 million. This trend sadly continues in areas of gas prices, home values, the national debt and deficit, inflation rates, and the total number of jobs. Additionally, under Obama’s presidency, Standard and Poor’s felt it necessary to downgrade the AAA credit rating of the United States for the first time since the premier rating was awarded in 1917. 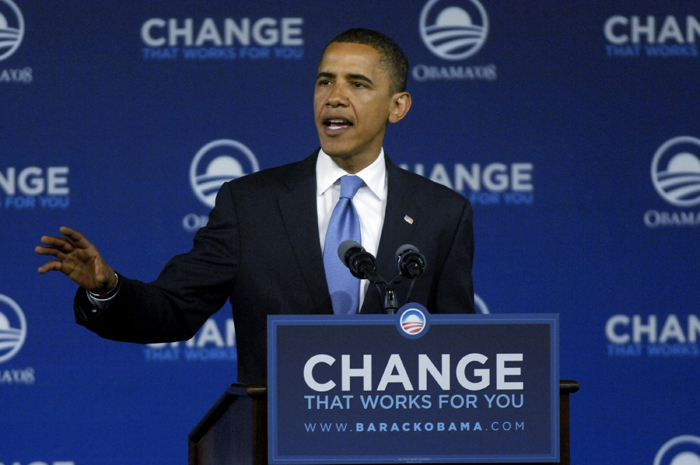 In 2008, Barack Obama was presented by the media as a candidate who possessed an unparalleled hunger for implementing radical, positive change for the nation’s economy. With a fast-forward to the recent reports of last month’s unemployment numbers (which is perhaps the greatest measure of an administration’s economic impact), the media has succeeded in enabling the 2012 version of Obama to subside his visionary hunger, and perceive an 8.5% unemployment rate as an achievement of “real progress.” The mainstream media declared that the United States has experienced a “hiring surge”, with proof that “the economy is finally recovering.” However, the caveat conveniently overshadowed by this joyous news of 8.5% unemployment is that we have reached the lowest rate in nearly three years. A more telling narrative would state that the 8.5% unemployment figure is the lowest since Obama’s first full month in office (which is February of 2009, the same month that Obama made his “one term proposition” remark) – yielding no true progress. The greatest danger of Obama’s failed economic policies is their role in establishing a new norm. Only in an Obama presidency does 8.5% unemployment (during the holiday season of December) equate to remarkable progress. The time has arrived for this nation to wake up. This includes the comprehension of 13.1 million Americans who are currently unemployed, and the 8.1 million Americans who work part-time jobs in order to compensate for the lack of full-time positions available. Additionally, among America’s youth, unemployment has reached over 17%, placing it at record level since World War II. If America continues growing in small amounts, averaging 130,000 per month (2011), it would still take decades to reach levels that mirror pre-recession numbers. Despite these figures, President Obama’s campaign strategy will probably attribute hefty amounts of blame to both the Bush administration and current Congressional Republicans. While it should be made clear that Obama inherited undesirable economic circumstances, it must also be understood that his time in the White House has statistically made the climate worse. It is imperative that the Republican ticket conveys the aforementioned data and figures, as well as their direct correlation to the Obama administration’s policies. This explanation must illustrate the dangerous spending and borrowing habits of Obama, including the fact that President Obama’s budget (or lack thereof) will contribute more to the national debt than the outstanding debt of all other presidents combined. Whether through stimulus packages, a healthcare overhaul, or quantitative easing, the unacceptable spending levels of the current administration has grown the size government while simultaneously impairing the spirit of free-enterprise entrepreneurship. The Obama administration has failed to foster an environment in which businesses feel confident in investing and hiring. It is this disastrous fiscal path that has led to the new normal state, which, for the survival of this nation, must be pragmatically raised by a capable candidate this November to the level of our rich tradition of economic excellence. Shifting Priorities: Riot Police for WWII Vets? Blame Bush doesn’t work when Obama said he would turn it around. What would you do if someone who worked under you said they’d do something, and when they failed, they blamed someone else? Would you be cool with that? Did you forget that the upward trend in unemployment began before Obama was in office? It should also be noted that the 8.5% unemployment rate is actually much higher. There are so many people who have given up on searching for work altogether that are no longer counted. It’s amazing to hear the liberal media praise an unemployment rate in the 8 percent range. He also declared that the first 100 days would be all he’d need to get things rolling, so why would anyone want to give him four more years?